Nene Valley Harrier Ruth Jones has developed a liking for unusual courses after winning the mountainous Ron Skilton Half-Marathon in Wales last autumn. When the 35 year-old entered the Easter Monday Nottingham 10k at Wollaton Park, she expected a testing run in a park that is used for prestigious regional and national cross country races during the winter. What she didn’t know was that the elements would conspire to make the Bank Holiday race a tortuous struggle for the 410-strong field. The heavy overnight rain had turned the off-road, hilly course into a quagmire, and to add to the challenge a gale- force wind, strong enough at times to stop the runners in their tracks,was blowing across the open and exposed park. Jones was equal to the challenge though and her determination paid off as she finished second lady in a time of 44:15 behind Great Britain veteran international Nicky Nealon. The intrepid Harrier is currently in training for one of the most eccentric races on the calendar - the annual man versus horse race held in the Welsh village of Llanwrtyd Wells in June. The race was established in 1980 as the result of a pub bet, and now sees over 600 runners testing themselves against upwards of 50 horses and riders on a rugged 21-mile course that takes in bogs, rivers and long step ascents and descents. Jones may have her work cut out as horses have been victorious for the last eight years. Lee Whitton of Eye Runners and Nene Valley’s Jay Belham were the first locals home in Monday’s Stanwick 10k. Whitton came out on top finishing 51st, with a 43:14 clocking. Belham was four places and 26 seconds further back. 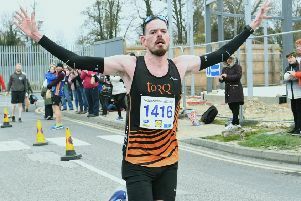 Several other Eye Runners made the journey to Northamptonshire, and 71 year-old Terry Fone was the star on the day coming home as first over 70 in 48:09. Deborah Nolan was fourth lady in 48:14 while Laura Conway was seventth lady with a 49:56 clocking. Her Eye team-mates Simon King, Dave Richmond and Martin Lainsbury were 126th, 137th, 144th and 174th respectively, with AnnaKing 242nd. Linda Threadgold completed the Eye contingent in 254th place out of the 312 finishers. The Thorney 10k takes place on Sunday (April 3) at Bedford Hall, with a 10:30am start. It will be preceeded at 10am by a 3k junior race. Entries will be accepted on the day on a first come first served basis.